London tram route 42 was my local service that provided a frequent 3/4 minute headway service into Croydon from half past five in the morning to almost midnight every day of the week although the first tram on a Sunday was not till 7 am. After the service was withdrawn in April 1951 it was so quiet! Picture 1906 was taken by H.B. Priestly from the steps of the Clock Tower and shows ex Croydon Car 392 [heading towards Thornton Heath terminus] and ex LCC E/3 Car 1906 [en route to Croydon], at their respective stops. To the right of the picture is Stuart Road which is flanked by Masons the Chemists and John Bell the Butcher and is the road I lived in until 1964. Sometime in the summer of 1949 I sat on the steps of the Clock Tower with my newly acquired ABC and started collecting tram numbers, but was quickly disappointed to see that I had only fourteen entries before repeats kept on appearing. How my Father was aware that I had spent just over an hour collecting these numbers was a mystery to me at the time! However, my interest in Trams [and, later, Trolleybuses] was born and it was not long afterwards that I was a member of the nearby Norbury Transport & Model Railway Club. I learnt from Club members that the war had interrupted the tram to trolleybus replacement programme and when re-considered at a later date the conclusion was that buses were to replace the remaining London tram routes. The creation of this WEB site made me wonder if a conversion programme had ever been drawn up, with dates that trolleybus would have come into service. 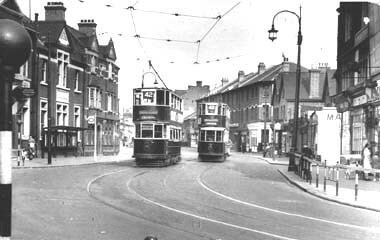 Research revealed that LPTB had intended to start on the south London conversions in the summer of 1940 and had already obtained all the necessary statutory provisions for routeings and new trolleybus turning circles. I therefore had to indulged in a little fantasy to create images of what might have been for my tram route 42. So instead of the appearance of Routemaster Buses on route 190, what would have been seen instead? With considerable help from Ashley Bruce, Irvine Bell, Peter Golds, Ken Glazier, Dave Wilsher, Palle Nilsson and reference to Hugh Taylor's book 'London Trolleybus Routes' [published by Capital Transport] a story has been put together. But before moving onto the next page please read this contribution from Henry Overal.